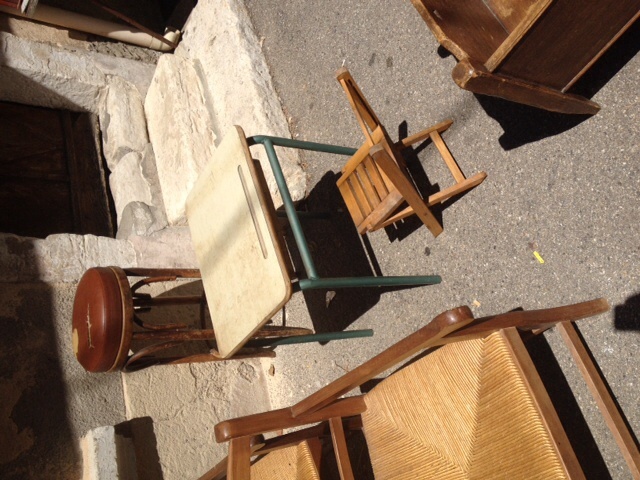 I spotted this very petit school desk in a brocante in Sault, while trying to find a cheap pair of scissors so the kids could go gleaning lavender from the just-harvested field we passed. The desk had a little more designed feel in person than in this photo, though, where it looks pretty spare/plain. As for the lavande, the kids just ended up using their fingers. We paid them 5 sous and a crust of bread for their day's labors. The one who gleaned the most got a spoonful of Nutella.